Orders ship the next business day and are usually delivered in 2-3 days standard! We gladly accept Purchase Orders from libraries and schools. Winner of the Telly Award for Excellence in Children's Programming! click to enlarge "It's a very busy day in Dinkytown...." A little wooden train is pretending to be a real train, but he doesn't know much about what real trains do - he's only ever seen them at crossing gates. With some help from the Narrator and lots of imagination, the Busy Little Engine and his friend, Pig, have a lot of fun learning about what trains do all day! Gentle transitions and easy pacing are appropriate for even the youngest viewers. Magical animations, real trains, and the loveable Pig make it fun for all ages (even parents and grandparents)! See how the show was made in "Making The Busy Little Engine "
Featuring three new songs by Jimmy Magoo! "It's a very busy day in Dinkytown...." A little wooden train is pretending to be a real train, but he doesn't know much about what real trains do - he's only ever seen them at crossing gates. 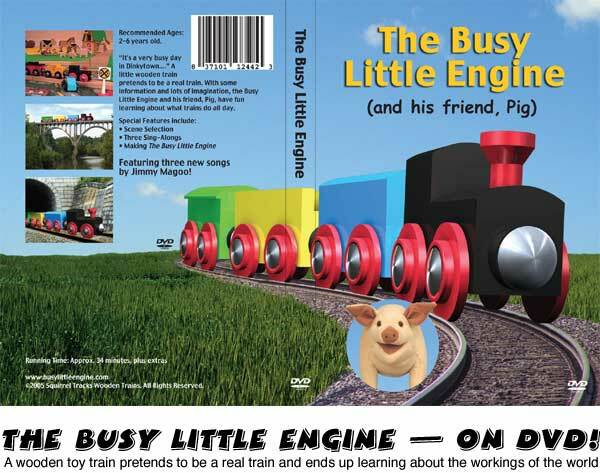 With some help from the Narrator and lots of imagination, the Busy Little Engine and his friend, Pig, have a lot of fun learning about what trains do all day! This is Busy Little Engine ™ - the little wooden train engine that inspired the DVD! Includes 1 Busy Little Engine™ wooden train engine. This engine is completely compatible and interchangeable with BRIO® , Maxim , Thomas & Friends™ brands of wooden trains, track, and accessories. For ages 3 and up (due to small parts). Is your kid a Busy Little Engine? These cute Ultra-Cotton 6.1oz Gildan T-shirts are still available in light pink, or daisy (yellow). They are no longer available in white and blue. The top-quality hand silk-screened shirts will endure a lot of wear and a lot of washing (which is very handy for Busy Little Engines). Please note that Gildan Toddler T-shirts are very generously sized, so for most kids, a 3T will easily last until the kid is 4-years-old. Grown-ups and kids love the cute profile of Busy Little Engine on the front. The back of the shirt says, "I like using my imagination!" Includes 1 DVD and 1 Busy Little Engine™ wooden train engine. Includes 1 DVD and 1 T-shirt in your choice of size and color. Don't forget the other busy little engineers among your extended family and friends! Buying for a library, preschool or fundraiser? Let us help! We're the publisher - just contact us for quantity discounts! Click on the thumbnail images below to see large screenshots from the show! Click on the thumbnail images below to see MPEG movie clips from the show! Click on the buttons below to hear clips of the songs! Since 2005, Busy Little Studios has been a producer of fun and gently-paced DVDs "illuminating the workings of the world for young children." Creative Director Desmond Mullen's background includes work with George Lucas's Industrial Light & Magic , Silicon Valley's Rocket Science Games and WebTV Networks , and creation of world-renowned science education shows at Morehead Planetarium and Science Center including Mary Pope Osborne's Magic Tree House: Space Adventure . "By focusing on a toy that is familiar to most children, we can present concepts about how the world works in a way that even the youngest child can understand and apply to his or her own life," Mullen says. He adds, "The excitement that a child has when he sees a thing in the real world that he recognizes, or when he applies a concept he's learned to a new situation, is wonderful. That thrill of discovery of the world is infectious. That's what I love about helping children understand the world around them." You are welcome to email Desmond at desmond@busylittlestudios.com with any questions or comments you might have.